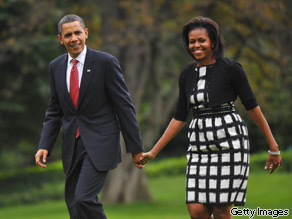 To many it looks like President Obama and First Lady Michelle have a picture-perfect marriage. In a candid interview with New York Times writer Jodi Kantor, the first couple revealed things weren't always so perfect. Kantor joined Kiran Chetry on CNN’s “American Morning” Friday. Below is an edited transcript of the interview. Kiran Chetry: You had a very rare opportunity to sit down with both of them for 40 minutes and ask them a lot of personal questions about their marriage. What struck you the most about that interview? Jodi Kantor: A couple of things. One was just being in the Oval Office, the place that symbolizes executive power and we were talking about things like date night. And another thing, you know, I think the question that elicited the most memorable response was I asked the president and first lady if it's possible to have an equal marriage when one member is president and it was a little tough for the president to answer the question. Chetry: So how did he answer it? Kantor: Well, he took a couple tries. I mean, he's normally so eloquent and fluent and he tried once and he tried again and then he said, I have to be really careful about how I answer this question. And Mrs. Obama is looking at him, intently, to see what he's going to say. And finally, she sort of stepped in to say, you know what, in our jobs, we are not equal now, but in our private lives we are. President Obama and First Lady Michelle Obama make their way from Marine One upon return to the White House in Washington, DC. They are everywhere... And they are growing. They are the "gotcha" fees – the hidden fees, the ones that you don't know about that come to your attention after you've received the service or product, and they hurt the most. Could distrust in government be a good thing? The latest public opinion polls do not bode well for our elected representatives: in some instances, they are suffering record low approval ratings. In a Wall Street Journal/NBC poll this week, just 23-percent of Americans say they trust government to "do the right thing" all or most of the time. That's the lowest number since 1997. A September Gallup poll showed public trust in Congress at a record low 45-percent. The executive branch, headed by President Obama, did better, with a 61-percent "trust" rating. Despite Mr. Obama's campaign promises for hope and change, many Americans have lost faith in Congress to make the right judgments about issues facing the country. This has stymied Mr. Obama's legislative agenda, says CNN Political Analyst Gloria Borger. "People have always had a kind of healthy skepticism about the bureaucracy. But what you find now is because people don't trust government, it provides a political opening for both parties to say – 'don't trust the other guy.' And depending on where you stand, you don't trust the other guy." Watch: Is government distrust good? Even the government's push to get the public vaccinated against H1N1 is being viewed with skepticism – despite the fact that the CDC reports 20-thousand Americans have been hospitalized and 1,000 have died from the illness. On the other hand, too much trust in government may have gotten the country in trouble in the past. After 9/11, trust in government was high. According to a CNN/USA Today/Gallup Poll in October, 2001 – 60-percent trusted the government to do the right thing always or most of the time. That trust, some say, may have helped President Bush make the case for the Iraq War, which most Americans now oppose. "When you have lower trust in government, you tend to get fewer foreign wars, you tend to get fewer expensive government programs, and you also tend to get fewer abuses of civil liberties, says Gene Healy of the conservative Cato Institute. In other words, public distrust might be an informal but much needed way of exercising checks and balances. What do you think? Could distrust in government actually be a good thing? 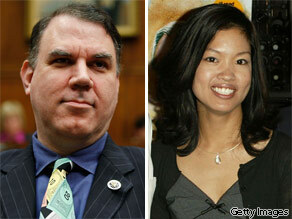 Rep. Alan Grayson (left) and Michelle Malkin (right). A Democrat who seems determined to win the race to the bottom and Republican commentators who keep pushing their party further to the right in a hunt for heretics – its all in the "Wingnuts of the Week." Plus, a bonus round: a racist image posted on the RNC's Web site. Freshman Rep. Alan Grayson (D-FL) has made a name for himself quickly in the halls of Congress, and he's done it the new fashioned way: by kicking and screaming and slandering. It sounds to me like Rep. Grayson is coming a bit unhinged in his quest for attention. He's putting up online advertisements asking people to give him money because he’s a "Democrat with Guts" – a similar move to the one pulled by Republican Joe Wilson after he shouted "you lie" at President Obama. And there are some Democrats who reflexively defend Grayson’s comments simply because he’s on their team. Being a professional polarizer does not make you an effective politician or even an effective communicator. Rep. Alan Grayson is again our "Wingnut of the Week" on the left. Editor's Note: CNN's Jill Dougherty sits down with Secretary of State Hillary Clinton in Pakistan. See the interview on "American Morning" Friday, 6-9 a.m. ET on CNN. Below is an edited transcript of the full interview. Jill Dougherty: Iran not agreeing to ship out LEU…is it time to stop talking and move to sanctions? Hillary Clinton: We are working with the IAEA, with France, Russia, the other members of the P5 +1 who are all united and showing resolve in responding to the Iranian response and seeking clarification so I am going to let this process play out, but clearly we are working to determine exactly what they are willing to do, whether this was an initial response that is an end response or whether it’s the beginning of getting to where we expect them to end up. Dougherty: But you have been personally skeptical … are you vindicated? Are you right? Clinton: Well, we are going the extra mile as we said we would, as the president made clear in his inauguration speech we would, and I think it's very significant that Russia and France and the UK, Germany, China are all united about this. I mean this is not the United States saying we have an idea, you know, we want you to follow through on. This is all of us saying: we came to this idea, you agreed in principle and we expect to have you follow through, so I think we’ll take it day by day, see what the final outcome is. Dougherty: One more on that: do you have commitment from Russian/China that if Iran won’t follow through on that specific part, that you would move forward on sanctions? Clinton: I don’t want to speculate or answer a hypothetical. I want this process to play out. This was an agreed-upon approach. I signed an agreement back in New York during the United Nations General Assembly, along with the foreign ministers of every single country that are members of the P5+1 and the EU, so you know, let’s see where this leads.